(Reuters) - A federal appeals court on Tuesday partially overturned the convictions of two onetime associates of former New Jersey Governor Chris Christie for their roles in the "Bridgegate" lane-closing scandal that helped scuttle his presidential ambitions. The 3rd U.S. 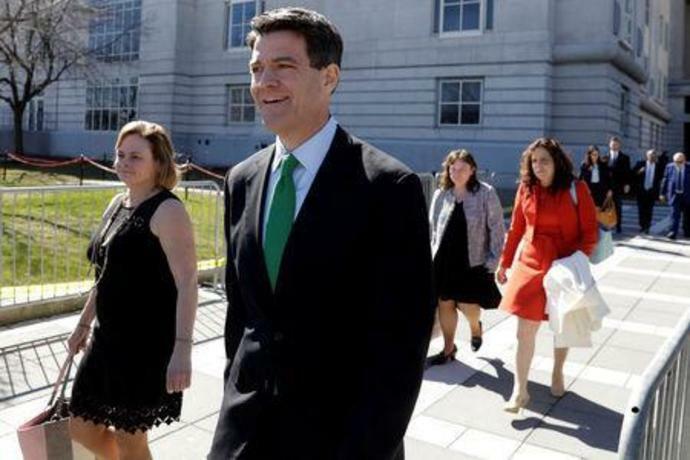 Circuit Court of Appeals in Philadelphia threw out two of the nine counts on which Bill Baroni, a former deputy executive director of the Port Authority of New York and New Jersey, and Bridget Anne Kelly, a former Christie deputy chief of staff, were convicted. Both will be resentenced. Baroni was given a two-year prison term in March 2017, while Kelly received a 1-1/2 year sentence. Prosecutors accused the defendants of arranging a September 2013 shutdown of access lanes to the George Washington Bridge, the world's busiest bridge, in Fort Lee, New Jersey, causing several days of gridlock. This was allegedly done to punish Fort Lee's Democratic mayor Mark Sokolich for refusing to endorse the successful re-election of Christie, a Republican, as governor. Christie denied involvement and was not charged, but the scandal hurt his national profile and contributed to record-low approval ratings in New Jersey. Michael Levy, a lawyer for Baroni, had no immediate comment. Kelly's lawyer Yaakov Roth did not immediately respond to requests for comment. A spokesman for U.S. Attorney Craig Carpenito in New Jersey said that office was reviewing the decision. In Tuesday's 3-0 decision, Circuit Judge Anthony Scirica reversed the defendants' civil rights convictions for impeding the travel of Fort Lee residents as a means to punish Sokolich. He said courts disagreed about how broad the travel right is, and the defendants could not have known they might be violating it. The appeals court upheld Baroni's and Kelly's convictions for wire fraud, including over an August 2013 email where Kelly informed Port Authority executive David Wildstein it was "[t]ime for some traffic problems in Fort Lee." It also let stand their convictions for misusing Port Authority resources, including to create a "traffic study" to supposedly justify realigning the lanes leading to the bridge. "The Port Authority has an unquestionable property interest in the bridge's exclusive operation," Scirica wrote. "Defendants invented a sham traffic study to usurp that exclusive interest, reallocating the flow of traffic and commandeering public employee time in a manner that made no economic or practical sense." Wildstein, the accused mastermind of Bridgegate, was sentenced to probation in July 2017 after pleading guilty and cooperating with prosecutors.